"One year wonders" are always interesting to find. They are watches that were only made for a single year. That doesn't necessarily mean the model is "rare" but it does make you wonder why it was produced for such a short period. Was it a dog? Did they run out of parts? Did the CEO not like it? Take, for example, the 1952 Franklin. It was produced for only that year. Based on the looks of the model, I would say that it wasn't a "dog" since it looks like a typical tank-style model and reminiscent of some of the popular solid gold models from the time. The model came in a 10K yellow gold filled case with a white-finished sterling silver dial and solid 18K gold numerals and markers. It's as fine a watch as any other entry-level US made Hamilton. One reason for it's short run could be the year it was produced. 1952 was the last year of the 14/0 movements... the 980, 982 and 982M. They were replaced by the 12/0 movements that same year... the 752, 753 and 754, respectively. Many 1952 models came in a "-B" version to denote the movement change. However, it's possible the Franklin was similar enough to other models from the time that the management-call was "why bother making a -B version". After all, in 1953 Hamilton introduced an entirely new line of watches... the Hamilton Illinois brand. So they weren't going to be short on model options. Of course, that's all just a guess. Maybe it was just a simple matter of poor market performance for the model. One thing is for sure, there aren't a lot of Frankins out there. 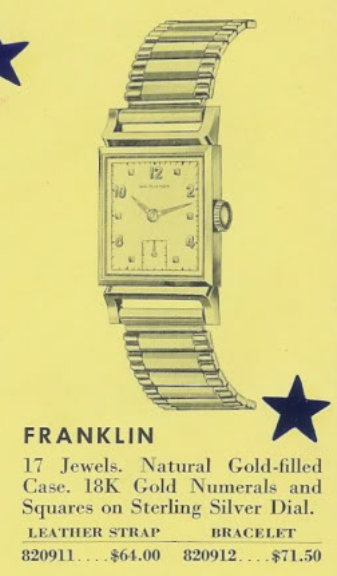 I received a Franklin in a lot of "parts watches" - the sort of pile-o-watches you'd buy to scavenge from. It was beat up, the dial was stained, it didn't run, you know - just the way I like them. I took a quick pass at cleaning the dial before the photo below and I though I might just pull a rabbit out of my hat but alas - it was really too far gone to save. If I was to clean off the upper right I would have lost more of the printing in the upper left. So this is a good candidate for a refinish. The crystal is totally trashed, inside and out. That's very odd. Well, I'm going to guess that whatever compromised the inside of the dial also got under the dial and rusted the barrel arbor into the main plate. This movement looks very dirty from the dial side. The backside of the movement isn't as bad - I'm sure it's dirty inside but the back looks nice. Hamilton did a nice job detailing even their most basic movements in the early 1950's. With the barrel bridge removed and the barrel taken out and flipped over, you can see the rust on the inside of the barrel cavity. I should be able to clean up the main plate well enough but I'll just replaced the entire mainspring barrel assembly with a different one along with a fresh white alloy mainspring. Everything is cleaned and dried. A new glass crystal is ready to be glued into the bezel. I'll let the glue set up under a UV lamp while I reassemble the movement. Success - the balance is vigorously swinging away. That's a good sign that I did a thorough job cleaning. Now to check it out on the timer to see how the balance and hairspring are behaving. Looks good - nice amplitude, acceptable beat error (could be less but why risk screwing it up?) and it's running 30 second fast per day without other extraneous noise. It will likely settle down after it runs a while. Now onto the other side. There's still a tiny amount of staining from the rust but the vast majority of it is gone. The stem, clutch, set lever, yoke and the winding pinion are lubed with microgliss lubricant. A fresh lizard strap completes the restoration and this uncommon Franklin is ready for some more wrist time. Another parts-watch saved. I have a Franklin as well it's a 752. I've got a problem the balance isn't swinging right. Any suggestions on how to fix it, if it's an easy fix or is there a major problem? The watch needs to be seen by a watchmaker. If it hasn't been cleaned and oiled it might just need an overhaul. You may have exposed it to a strong magnet (like put it in your golf bag next to a magnetic ball marker). Or maybe it was accidentally dropped and a pivot is bent. It could be an easy fix or it could be a big problem... only a watchmaker could say. Send me an email if you'd like a couple of recommendations. Is it a Franklin or another model? Value is really a function of condition. If it has a lot of wear, needs a new crystal, etc. it's value is on the low side ... $50 give or take. Thanks for this post. My grandmother gave me a Franklin as a high school graduation gift. It has never run a minute and has sat in my desk drawer in its original box for the past 45 years. I've never worn a watch before but I'd like to start. I also find the bracelet uncomfortable. Can you recommend a good watchmaker in Minneapolis? Check out the AWCI.com website for watchmakers in your area. Or you can email me for recommendations, but they aren't in your area. I haven looking for a 1952 Franklin as that is the year in which i was born. I’ve found several on line but the dials look pretty nasty compared to your refurbished dail above. Any suggestions? There will always be another but if you're in a hurry then buy the one with the nicest case and have the dial refinished.